As promised, my thoughts on Marvel’s latest box office juggernaut, “The Guardians of the Galaxy.” Also as promised, I roped in my good friend, Ben DeLoose. I’ve known Ben for over seven years. He has worked for USA Network, NBCUniversal, and most recently, Starz Entertainment. He and I also collaborate on 3bythree, a Youtube movie review channel. Before we get started, a brief plot synopsis, but be warned, our discussion will contain spoilers: “Guardians of the Galaxy” tells the story of Peter Quill (Chris Pratt), a young man abducted from earth who traverses the galaxy looking for rare artifacts (think: a goofier Indiana Jones). 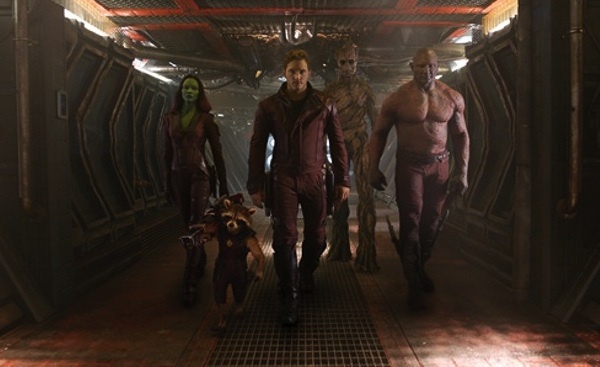 He joins a ragtag group of misfits, which includes: Gamora (Zoe Saldana), a trained assassin; Drax (Dave Bautista), a muscular alien who takes things a little too literally; Rocket (voiced by Bradley Cooper), a genetically engineered raccoon with a propensity for technology and weapons; and Groot (voiced by Vin Diesel), a humanoid plant and Rocket’s partner. They will work together to try to stop Ronan (Lee Pace), a radical fundamentalist, from obtaining an ultimate weapon. Ben: What a fun ride! A fantastic summer entertainment and another winner from Marvel. Gar: I thoroughly enjoyed myself! Though it carries the Marvel banner, it had a bit of that new car smell. It’s not an original property, but it’s based on a comic book that I had no familiarity with. Ben: Same here. I had absolutely no knowledge going in. 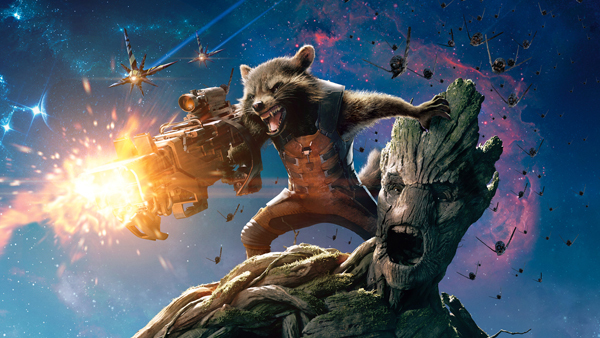 Gar: I’m reluctant to call “Guardians” a GREAT movie, though. Marvel plays things a little too conservatively for that. Even “Iron Man,” which is still their best, has that really standard third act (crash-bang action, monologuing villain, etc.). Ben: They are, by no means, making revolutionary films. Consistent entertainment? I’d say so. Non-stupid blockbusters? Absolutely. But they do regress back to their comic book roots. There’s some clunky dialogue in all their films, including this one. Flat exposition dumps, characters blandly stating their inner intentions and feelings. Gar: An instance that stands out to me was Thanos, this intergalactic warlord, revealing that Gamora (pictured below, left) was his favorite daughter in front of his other daughter Nebula (pictured below, right). Gar: Maybe there’s something to be said for Thanos’s arrogance and dismissiveness, but you just knew they were setting up a betrayal. 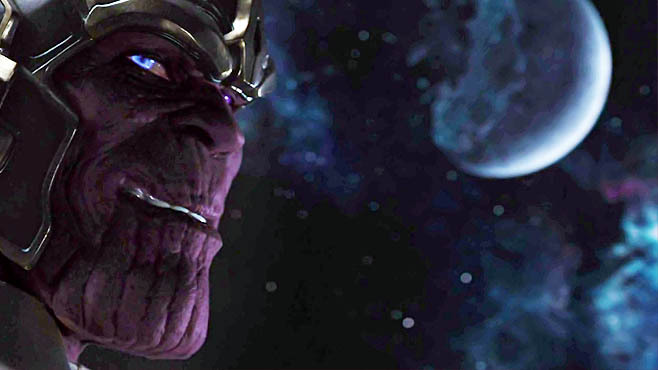 Ben: In general, Thanos is a problem for this film. Will casual viewers realize he was part of the invasion in the “The Avengers?” Will they remember his stinger scene during the closing credits? Probably not. Hell, the characters in the film don’t even mention the invasion to Peter Quill, despite a clear setup. I think a character tells him, “You don’t even care about your own world,” and leaves it at that. Why not mention the attack? Why not use that as extra motivation for Peter to put a stop to Ronan? Gar: Exactly. Marvel seems to have a villain problem. Lee Pace is a good actor, but I just didn’t find Ronan compelling. Some people have compared “Guardians” to Star Wars, which I think sets up a troubling level of anticipation. Influenced by? Absolutely. As good as? C’mon now. But the #1 reason Star Wars is better than “Guardians?” Its villain. Gar: Let’s talk about some of the things we liked. Ben: The soundtrack really stood out. The song selection was impeccable! It created plenty of opportunities for incongruity with the visuals, and it was diegetic. Gar: It also gave the film an identity, which the marketing campaign wisely tapped into. (We should stress we’re talking about the unoriginal music used in the film — ’80s songs. The original score was pretty forgettable, which seems to be par for the course for Marvel.) I really enjoyed the songs too. They added a nice layer to Peter. You can’t help but be reminded of his mother, which of course pays off hugely at the end of the film. 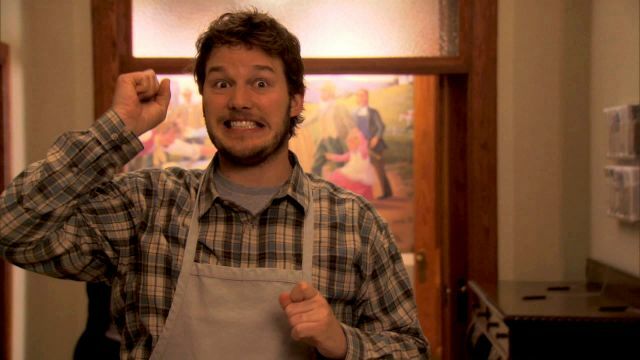 While we’re on Chris Pratt, let’s go ahead and talk about the cast. Gar: So good! I am a fan of Pratt from “Parks and Recreation,” and it was great to see him carry a film of this size. Ben: It was also fun to see Karen Gillan as a bad guy (and she’ll be back)! Though Peter Serafinowicz and John C. Reilly could have had more to do. Gar: Yeah, I was surprised by how little screen time Reilly had, ditto Benicio del Toro and Glenn Close. Those are big name performers! Ben: I think they could have gone with character actors for those parts. Gar: But ya know who gave the best performance? Ben: You really felt Rocket’s vulnerability under all that bravado. Yes, the CGI was excellent, but the pain in his voice drove it home for me. Gar: He’s got that scene where he unloads this emotional baggage, talking about how he was poked, prodded and sliced while they were experimenting on him. I really liked his relationship with Groot as well. One of the moments that made me laugh was Rocket’s conversation with his “house plant,” where they discussed their next move. Ben: It’s basically an internal monologue for Rocket. Gar: Absolutely. Let’s talk a bit about writer-director James Gunn’s work. I thought the action scenes were great. They were well structured, and characters were using the environment. I’m thinking about the first one, this “Raiders”-inspired set piece where Peter steals an important artifact. A hole gets blown in the wall of this temple, and a couple beats later, our hero uses it as his escape route. Ben: Gunn nailed the action scenes. Clear sense of geography, cause-and-effect, scale — all things lacking from a lot of loud, dumb blockbusters. Gar: The smaller ships pushing Ronan’s much larger vessel was a great visual. Ben: The will of many against one fanatic. Fancy that, a visual metaphor in a popcorn flick! Gar: You don’t say! The other thing I really appreciated about Gunn’s work was the way he managed the tonal shifts, from laugh-out-loud comedy to real pathos. You’ve got Rocket’s monologue or Peter reading the letter from his mother. Ben: The moment that absolutely got to me: “We are Groot.” As he was saying it, I expected “We are friends,” but what they went with was much stronger. Gar: So much stronger! It would have been corny and out-of-character if he had said “We are friends.” Anything else you wanna talk about, Ben? Ben: Can’t wait for the sequel! Gar: Me too. Thanks for doing this! We’ll have to do it again.